This article is about the locality in Queensland, Australia. For the mountain range in Queensland, see Hervey Range. For the mountain range in New South Wales, see Herveys Range. 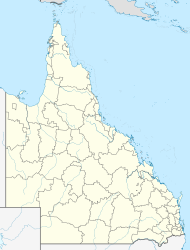 Hervey Range is a rural locality split between the City of Townsville and the Charters Towers Region, Queensland, Australia. As the name suggests, the locality includes the Hervey mountain range. The split between the two local government areas roughly follows the ridge line with the Townsville City Council responsible for the coastal (eastern) side of the locality and Charters Towers Regional Council responsible for the inland (western) side of the locality. Apart from the ridge itself, the land on the Townsville side is generally much lower (50–100 metres above sea level) compared with the higher land on the Charters Towers side (550–600 metres about sea level). The mountain range and the locality were both named by Phillip Somers after Matthew Hervey of Dotswood pastoral station. Somers and Hervey were co-owners of Dotswood station and Somers was also a member of Allan Cunningham's expedition. Barringha is the local Aboriginal name for the Hervey Range which is also their name for the Western Silver Wattle. ^ a b "Hervey Range - Townsville City (entry 44600)". Queensland Place Names. Queensland Government. Retrieved 15 January 2016. ^ "Hervey Range - Charters Towers Region (entry 47871)". Queensland Place Names. Queensland Government. Retrieved 15 January 2016. ^ "Queensland Globe". State of Queensland. Retrieved 14 January 2016. ^ "Range Hotel, Burial Ground and Camping Reserve (entry 700003)". Queensland Heritage Register. Queensland Heritage Council. Retrieved 16 July 2013. This page was last edited on 18 March 2019, at 05:03 (UTC).